This is a very early production "Deluxe" model Les Paul. Gibson first introduced this model, which features the small hum-bucking pickups sometime in 1968. This example was built in late 1968 or very early in 1969. 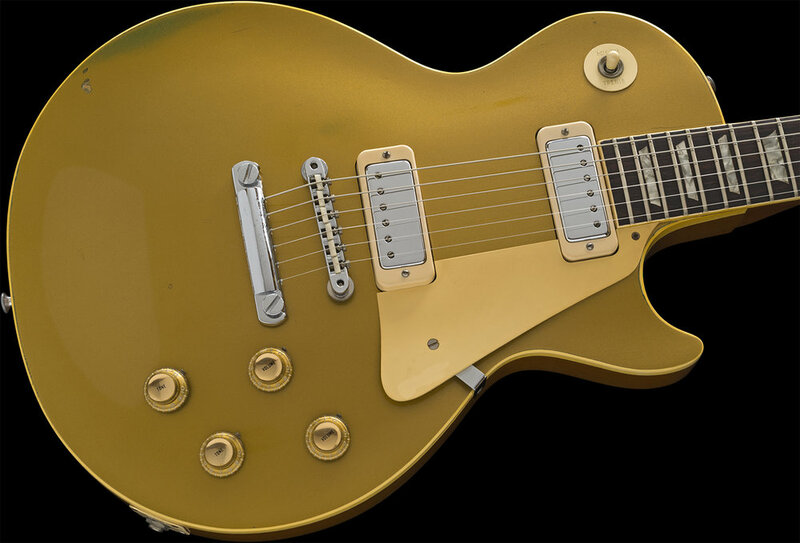 The late 1960's period is considered to be the end of the better Gibson production years. This guitar predates the less desirable production changes that were brought about during the Gibson-Norlin regime that shortly followed. Many of those changes took place shortly after this guitar was made. 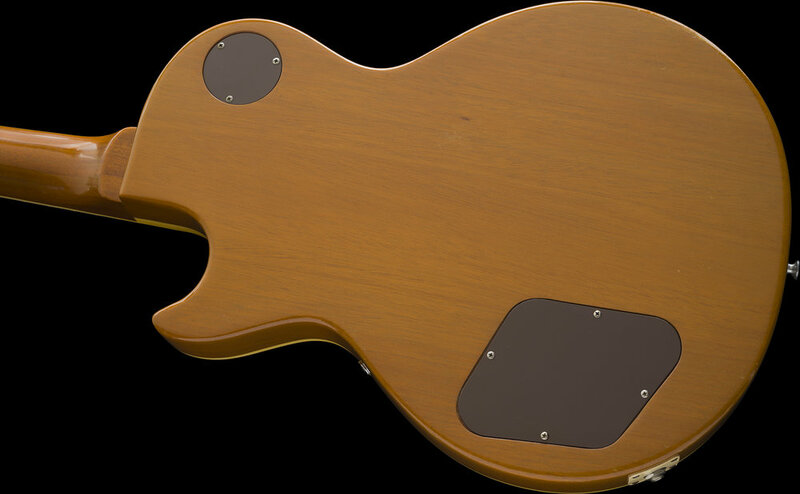 This example is early enough to feature the harder to find solid 1-piece Mahogany body construction. 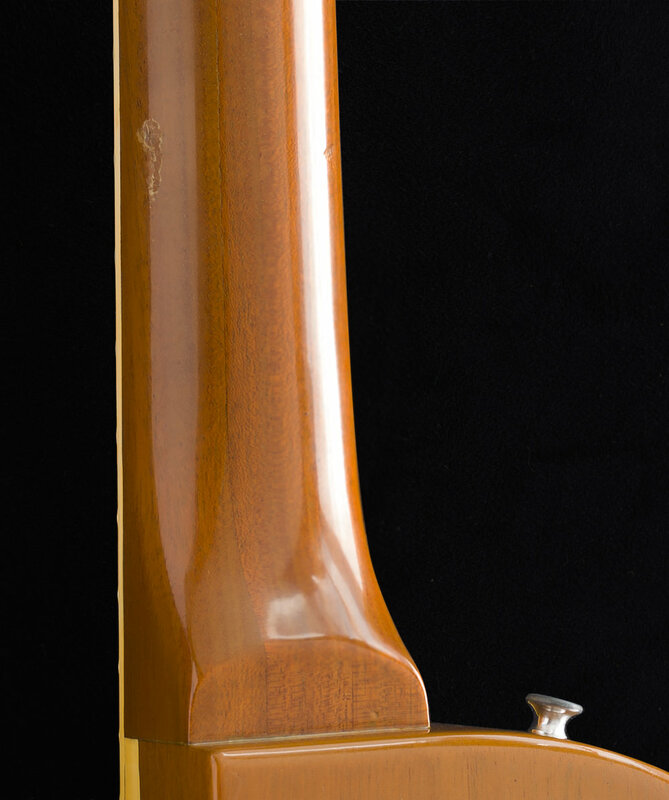 It has the 3-piece Mahogany Neck which was made without the Neck Volute or "Made in USA" Stamp on the back of the headstock. It also has a beautiful, eye-pleasing Gold finish that has gently and naturally aged, displaying a lovely patina and warm vibe. I have examined, tested, serviced and set-up this instrument and found it to be correct and unmolested in every way. All of the electronics, frets, nut, tuners, finish, and both the plastic and chrome plated metal hardware are correct and original to the guitar. The Gibson trademark ABR-1 bridge still has it's NYLON saddles too. The 4 potentiometers are matched and dated the 6th week of 1969. Remarkably, this instrument has not finish-checked. It was sparingly played long ago and then stored by me until today. 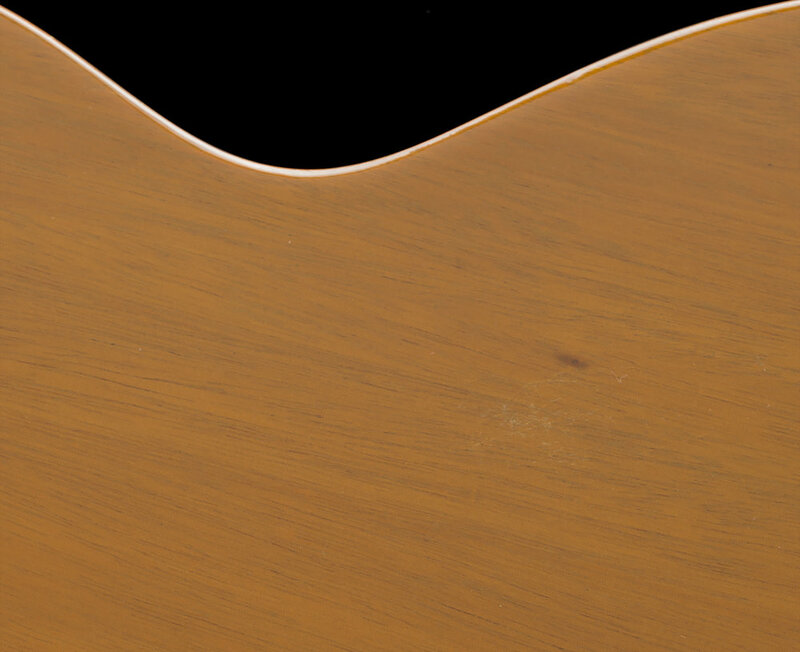 The guitar displays some usual but very minor wear marks globally including the slight oxidation (greening) that is visually present on the face, located on the bass side of the body along the "arm-wear" area edge. 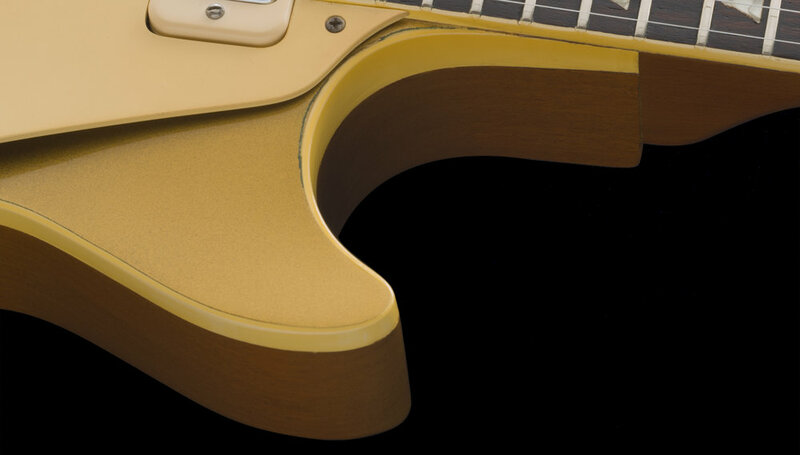 The back of the body has some minor impressions and minor wear marks, but it's minimal and does not detract from the impressive appearance of this Vintage Gold Top. 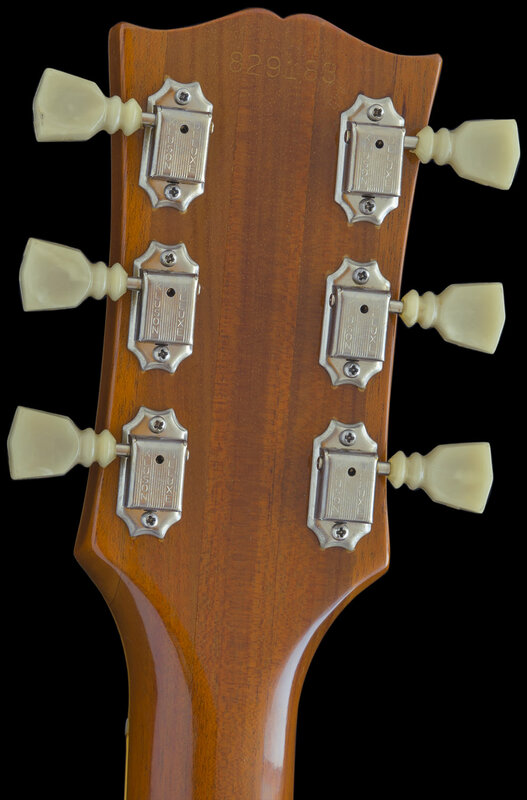 There is a small area on the back of the neck located at about the 9th fret where some minor finish damage has occurred. This wear is situated more on the treble side of the neck with some less significant marks being present on the bass side too. I surmise this is from contact with an older guitar stand's rubber-coated neck support, which was used at some point in its life. The rubber materials used on the older stands and even those old "curly" guitar cables often interacted with finishes when they were left in contact with for extended periods of time. If you look closely, you may notice a small area at the lower left side of the Pick Guard which is a bit lighter in color. It seems to me to have been caused by someone rubbing or possibly cleaning something off of the PG, it came to me this way long ago, and I wanted to point this out, although it is quite minor. The CASE is the original, factory-issued plush-lined model, which are highly coveted. These feature Black Tolex covering with a Yellow interior lining. Being an early example, it has the correct BRASS colored hardware sans logo. The case is in excellent, matching condition with a fully functioning handle, latches, and hinges. I acquired this guitar 28 years ago while running my store and because of it's attractive allure, I decided not to offer it for sale and it subsequently never made it onto the walls of my shop. This vintage Les Paul gold top is now 49 years old and has been safely stored since I acquired it and has been spared all of the "circulation" that most instruments being offered online today have undergone. If you like this model, the chances of finding an example of this caliber may not be easy to come by. This guitar is crisp, clean and NOT had any repairs, parts restoration or modifications of any kind, it is still factory-original, and the frets remain in excellent condition. Clean, factory straight instruments are growing more difficult to acquire, if you desire better quality instruments, this may appeal to You as it did to me. Please inquire.